We need pediatricians to step up their efforts. They play a critical role in helping parents to understand why their children need flu vaccine every year. Vaccine requirements can also help ensure more children are vaccinated annually. The growing focus on influenza (flu) vaccination requirements for children enrolled in preschools and day care centers led the National Foundation for Infectious Diseases (NFID) to release a new report that examines the impact of such requirements in improving and maintaining higher vaccination rates among young children. “We’re encouraged by the improvement in pediatric flu vaccination rates overall, but there is more work to do to ensure children are immunized every year. One area of focus has been implementing vaccination requirements in the day care and preschool setting,” said Carol J. Baker, MD, past-president of NFID, chair of the Childhood Influenza Immunization Coalition (CIIC) and professor of Pediatrics, Molecular Virology & Microbiology at Baylor College of Medicine. New Jersey, Connecticut and New York City have implemented flu vaccination requirements in the past six years. NFID and CIIC, in collaboration with the Association of Immunization Managers (AIM), convened a panel to discuss the challenges and strategies these jurisdictions employed to establish and implement the mandates. The panel discussion informed the report, “Flu Care in Day Care: The Impact of Vaccination Requirements,” which distills experiences into lessons learned and best practices. 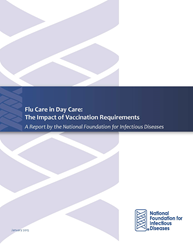 “This report can serve as a valuable guide for other jurisdictions considering similar flu vaccine requirements to protect young children,” noted Marla Dalton, CAE, NFID executive director. Each year in the U.S., approximately 20,000 children under 5 years of age are hospitalized from flu-related complications. According to the Centers for Disease Control and Prevention (CDC) there were reports of more than 400 flu-related deaths in children between 2010 and 2014. As of January 17, 2015, a total of 56 pediatric flu-associated deaths have been reported so far this season. Although flu vaccine coverage rates have been on the rise for many years, they remain among the lowest of any routinely recommended vaccine for children. Nationally, 30 percent of children 6 months to 4 years of age are not getting vaccinated, which translates to millions of unvaccinated children across the country. In addition to preventing influenza and its complications in these young children, Dr. Baker noted that widespread vaccination within day care and preschool settings can also help reduce transmission of the flu virus to others in the household and to the community at large since children are significant spreaders of influenza. While it is difficult to assess the direct impact of preschool and day care flu vaccine requirements, there is early evidence that suggests they are effective. A Yale School of Public Health study found an increase in flu vaccination coverage and a decrease in flu-related hospitalizations in young Connecticut children since the regulations took effect. The NFID report summarizes key learnings and shares strategies used to implement these requirements including the importance of education for parents, school providers and healthcare professionals. -Early and frequent communication is key. Conduct outreach to parents, day care and preschool providers, community leaders and healthcare professionals well before requirements are implemented to ensure ample time to plan and prepare. -Education is critical. Increase efforts to address any educational barriers or misconceptions so parents understand the risks of flu and the benefits of annual vaccination. -Compliance can be a challenge. Evaluate and consider expanded infrastructure to ensure timely flu vaccine delivery. In addition to doctors’ offices, pharmacies and public health departments, hospital- or school-based clinics can serve as viable options for administration of flu vaccine to children. The National Foundation for Infectious Diseases (NFID) is a non-profit 501(c)(3) organization dedicated to educating the public and healthcare professionals about the causes, treatment and prevention of infectious diseases across the lifespan. Created by NFID in 2007, the Childhood Influenza Immunization Coalition (CIIC) is a coalition of more than 30 leading medical, public health and parent organizations brought together by NFID to help address and improve influenza immunization rates among children. For more information, visit http://www.nfid.org and http://www.preventchildhoodinfluenza.org.